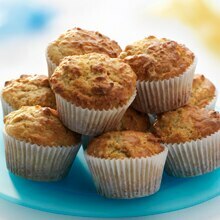 Wake up to mouth-watering aromas of freshly baked banana muffins. Use Country Crock® Baking Sticks to make them extra moist and delicious. These treats will disappear in record time. Preheat oven to 375°. Grease 12 muffin pans or line with paper cupcake liners; set aside. Combine flour, sugar, baking powder and baking soda in large bowl; set aside. Beat eggs, milk and melted Country Crock® Baking Sticks in medium bowl with wire whisk. Stir into flour mixture with wooden spoon just until blended. Fold in banana and almonds. Evenly spoon into prepared pans. Bake 20 minutes or until toothpick inserted in centers comes out clean. Cool on wire rack 10 minutes. Remove from pans and cool completely. Sprinkle, if desired, with confectioners sugar.